Narrow web label printing system leader Afinia Label announced today that they have completed a reseller’s agreement with Crown Packaging of Chesterfield, Missouri. Crown Packaging will be selling the Afinia Label L801 Color Label Printer; Epson ColorWorks C3500, C831, and C7500 label printers; and related supplies. The Afinia Label L801 and Epson label printers will allow our clients to add full-color product images to their labels to increase the accuracy of placing and picking inventory. 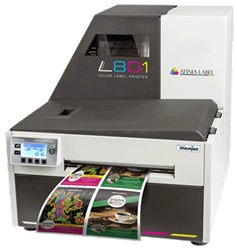 The Afinia Label L801 Color Label Printer is powered by Memjet technology, which gives it a print speed of 60 feet per minute and an industry-leading ink cost of less than 3 cents for a 4” x 6” label with 75% coverage. This is a fraction of the cost of other inkjet label printers. The L801 supports 3 print modes: Roll to Roll, Roll to Cut, Print & Hold. Epson ColorWorks Label Printers are designed for on-demand, short-run primary and secondary label production. They also comply with BS5609 standards, when used with a proper label substrate. Afinia Label emerged as a digital label printing system leader in 2012 when they collaborated with Memjet to create a commercially viable narrow web label printing solution. Afinia Label is now one of the largest distributors of Memjet-based label printers in the world. Crown Packaging Corp. is one of the nation's leading providers of industrial packaging products and equipment, since 1969. With dozens of US and Canadian locations, they are committed to serving thousands of customers by delivering innovative packaging solutions and uncompromising service.